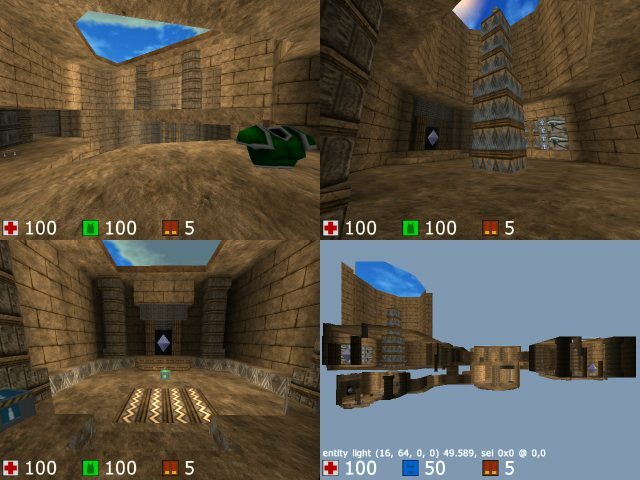 Blurb Remake of Quake map ultrav, Small Egyptian themed 1v1 or light FFA map. This is a remake of ultrav, a somewhat popular Quake deathmatch map. Eqyptian themed, with slight room over room. The conversion is about 80% accurate. Geometry changes include omission of one-cube floor and ceiling edging, slightly longer hallways (to eliminate room over room in favor of perpendicular hallway over hallway), and slight changes in some corner shapes to allow for Cube's tricky corner rendering. Entity placement is effectively arbitrary, with only a little ammo and the Quad remaining in place, due to the disparity between Quake's available items as well as Cube's lack of multiplayer triggers. The map plays well with 2-4 players. It is 'smaller' than it looks due to three teleports making it far more connected than it would seem at first. There are no dead ends, with at least two ways out of every room.